Bake for 20-23 minutes until the vol au vents have risen and are golden. If the bottom of the circles have risen a little, push them down with your finger. Brush the 4 whole circles with an egg wash. Place the other circles with the cut out center on top of the whole circles and then brush the top of that with egg wash. Place on baking sheet. 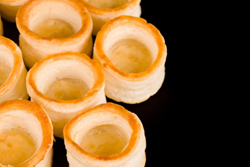 Prick the inside of the vol au vent with a fork several times to keep the bottom center from rising. Using a 4-1/2 in cookie cutter, cut out 6-8 circles. Using a smaller 3-1/2 in cutter, cut out a center hole in each of 4 of the already cut circles. Place the smaller cut out circles on a baking sheet lined with parchment paper. Those will be the tops for the vol au vent if you choose to use them. Brush these with an egg wash.
Place the puff pastry sheet(s) on a lightly floured surface. Place the frozen puff pastry dough on a plate and cover with plastic wrap. Thaw in refrigerator. Fill the cups with your desired fillings. Note Work quickly while the dough is still cold. If it warms up, place it in the refrigerator for about 20 minutes before baking. The dough will rise better when cold. Note In the video, the vol au vent are brushed with cream instead of butter. Either way is acceptable. The butter will give a sheen to the pastry shells, the cream gives a more matte finish. Note If you want to use the vols au vents as appetizers, use smaller cutters for bite size pieces.